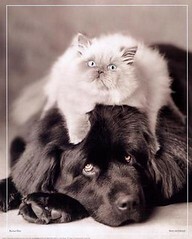 Request that the U.S. Congress enact legislation to require pet food manufacturers and the companies that market those pet food brands to be held financially liable for any medical costs related to or contributing to the illness and/or death of a pet that can be reasonably attributed to the food consumed by the pet. 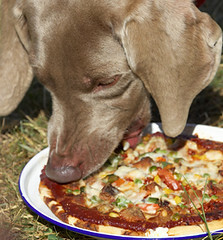 And that all pet foods include the name of the manufacturer, not just the brand under which it is sold. This petition is in response to the thousands of pet parents and owners who have suffered under the Menu Foods recall and their slow response that started on March 16th, 2007. Or read about all the latest news surrounding the recall. It’s Wednesday and it’s time for a funny pet video to get through the rest of the week! 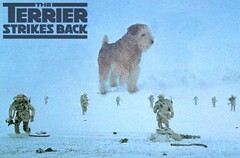 We know many of you are concerned by the news of sick and lost pets. We hope that this brings you a little joy. The video starts with cats, if you want to skip to dogs, it starts around the 2:33 remaining mark. 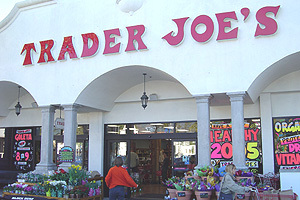 Although not a part of the Menu Foods recall list, Trader Joe’s is recalling all pet foods made by Menu Foods. According to the FDA, Trader Joeâ€™s pet food products are NOT the same pet foods that are currently being recalled by Menu Foods. However, since safety is of the utmost importance to us, as an extra precaution we have voluntarily pulled all canned pet food items manufactured by Menu Foods from our shelves until we can test the products and be 100 percent sure they are safe for your pets. The products voluntarily pulled are: Dog Food Chunky Beef 22 oz., Dog Food Chunky Chicken 22 oz., Dog Food Lamb & Rice 22 oz., Cat Food Turkey & Giblets, Cat Food Premium Fish/Salmon/Rice and Cat Food Premium Chicken/Turkey/Rice. If for any reason you would like to return Trader Joeâ€™s canned pet food products, please bring it back to any of our stores for a full refund or exchange. If you and your dog are label whores but are also bargain shoppers, then Seattle Premium Outlets are the place for you both! At the Burberry Outlet and the Coach Factory Store, you can find designer labels at bargain basement prices (okay, not that cheap but it’s a lot cheaper than if you bought them at a retail store). At Burberry, we found many fashionable items for your pooch: the classic Burberry trench coat, a fur lined (don’t worry, it’s faux fur, so your pet won’t protest) suede hoodie jacket, polo shirts, leashes and collars, comfy pet beds, and pet carriers. 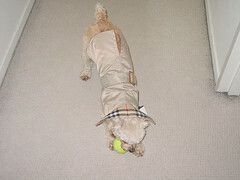 In fact, the Burberry outlet has increased their pet section in the past few months. Prices are 25-65% off the retail price for both doggie and human items, so you and your dog can have matching Burberry coats (oh, admit it, you know you want your dog to own a Burberry coat and be envied by all of the other dogs). At the Coach Factory store, we found various leather dog collars – some were more plain and just had the Coach emblem on it and others were a little fancier with little charms on them. The collars were around $29. Of course, there was a doggie Coach jacket with the classic Coach monogram on it. Beware the Coach Factory store gets really crowded with crazy women searching for a good bargain, so don’t be alarmed if someone pushes you down to grab a purse (although the staff there is quite helpful and friendly, just not your fellow customers). And, if you’re not into buying designer name goods for your pets, you and your dog can just take a walk around the stores and laugh at the people fighting for a sale item. Add your caption here in the comments! Seattle’s own Nintendo has a little hit on their hands. No, I’m not talking about the Wii, but the cool little Nintendo DS and the game Nintendogs. Unfortunately for many dogs, it seems like many parents have taken to their virtual pets a little too fondly. Now, one Chicago dog has had enough and struck back (we’re sensationalizing, but really, it quite ironic). You are currently browsing the Itchmo Forums Blog blog archives for March, 2007.